We are looking to add to the smallbore program! If you have an idea, please let us know. The Smallbore director is responsible for overseeing Smallbore and Air Rifle programs throughout the state of Oregon. 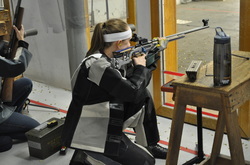 Annually the Smallbore director runs the Oregon State Smallbore Championships and the Oregon State Air Rifle Championships. In addition to the state championships, there are various matches and programs run throughout the state of Oregon! 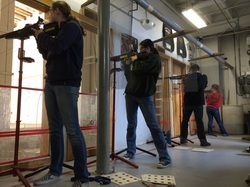 If you are looking to get involved in shooting, smallbore and air rifle is a great way to go! 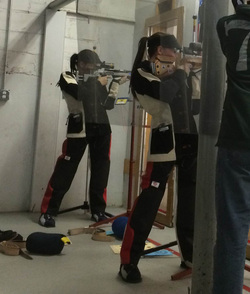 Scroll down to see a list of smallbore and air rifle programs in your area! If you do not see your program listed, please let us know and we will be happy to add it! Shooters shoot 10, 20, 30, or 40 shots from three different positions: prone, offhand, and kneeling depending on the match. Equipment used in these matches includes: .22 caliber target rifles, scopes, shooting jackets, shooting pants, shooting boots, kneeling rolls, prone mats, slings, and offhand stands. In 4 position smallbore matches shooters also shooting from the sitting position and in prone matches shooters shoot only from the prone position. Other courses of fire include indoor 60 shots standing matches and prone matches, and outdoor 3 position and prone matches from 50 meters and 50 yards distances. Similarly to 3 and 4 Position air rifle, shooters shoot 10, 20, 30, or 40 shots from three different positions: prone, offhand, and kneeling; or 60 shots from the offhand position, depending on the match. Equipment used in these matches includes: .177 caliber air rifles, scopes, shooting jackets, shooting pants, shooting boots, kneeling rolls, prone mats, slings, and offhand stands. Sporter air rifles are characterized by their light weight (5-7 lbs. ), low cost, basic target features, and suitable accuracy. Target shooting clothing or equipment is not required, or even permitted when shooting sporter air rifle. Courses of fire include both 3 position and 40-60 standing matches.